I have a fascination for miniatures. When I was a kid, I used to build dollhouses for my dolls. They were made out of my cousin’s diaper cardboard boxes—the only cardboard boxes I could get my hands on at the time, and they were sturdy. I painted them, cut holes for the windows and the doors, used the partition sheet (used to separate the diapers) to make the floor, built stairs with folded and reinforced paper, glued fabric to make the curtains. Hours and hours of fun. Then I forgot all about them. 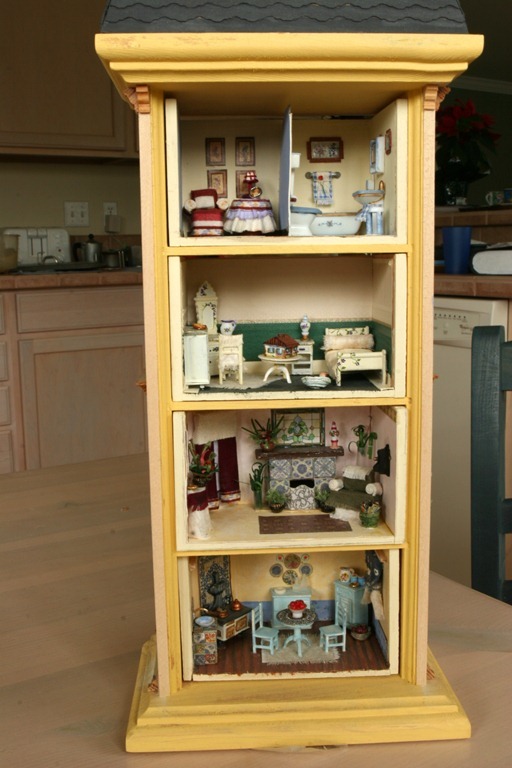 In the last fifteen years, I rediscovered the wonderful world of dollhouses. One of the thing that was immediately clear to me, after building several structures, is that, although a miniature, a 1/12 scale dollhouse requires space to be displayed. Space that not everybody can spare, especially when you build or collect them. The Quarter Inch Scale is the perfect solution. 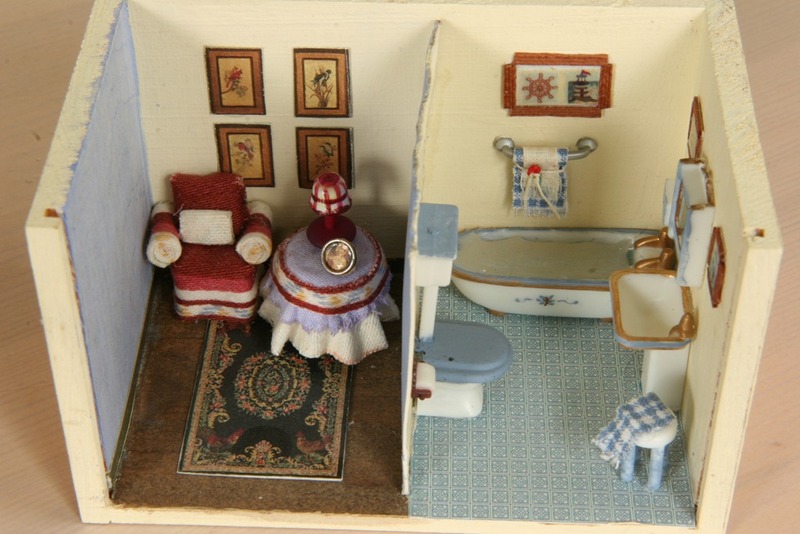 Four times smaller than a regular inch scale dollhouse (1/12), this miniscule scale can be quite whimsical. It took me some time to build my quarter inch scale Condominium, a kit I bought at a Seattle dollhouse show, but I enjoyed the process of finding objects that could be used to make furniture and decorations. For example, I used a 1/12 scale teacup to make the lamp shade in the small sitting room. Glue gun drops became the pitchers displayed in the kitchen. Cutout from catalogs became rugs and wall accents. Beads became tomatoes; a game piece from Monopoly became the dollhouse in the girl’s bedroom. Scraps of laces and fabric became sofas and couches. 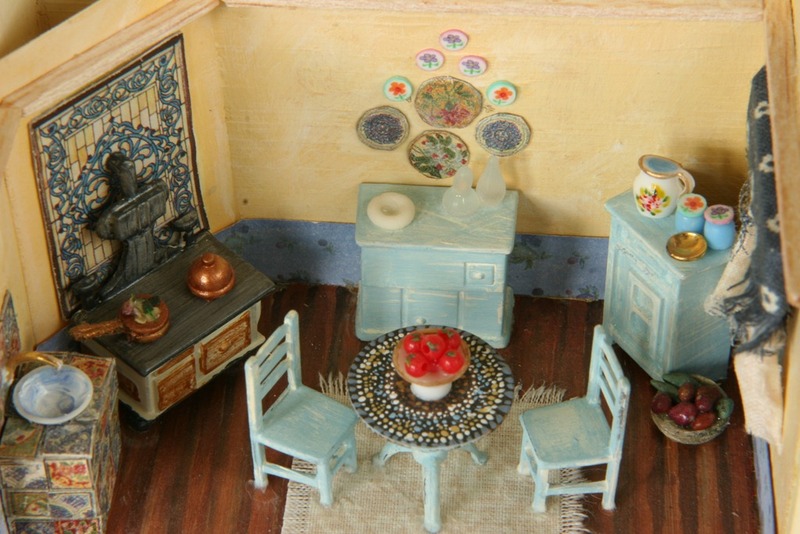 Recently, someone made me notice that the miniature kitchen looks a lot like my real one. 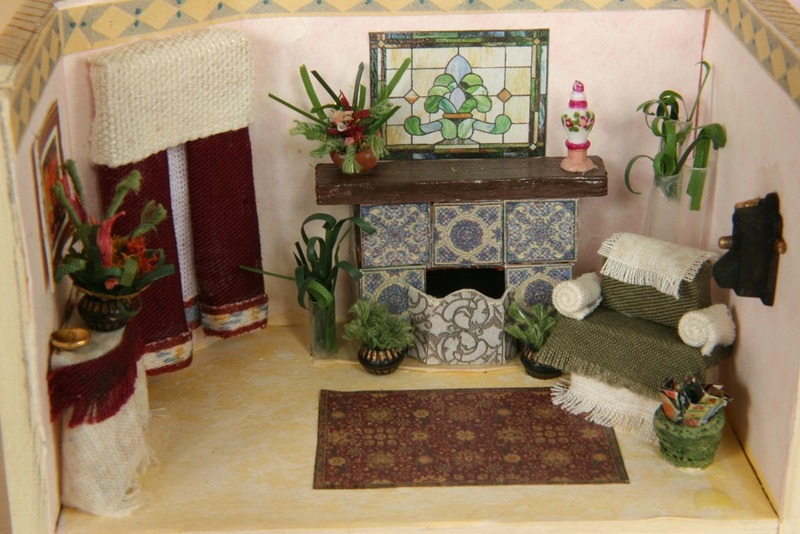 Maybe, in the next remodeling of my house—one is due soon, I’ll have the tile sink and the iron stove added as well, to match the rest of the room with my miniature one. One can only dream. I’ve talked about this little project of mine, here as well. ← Pax in the Land of Women: Possibly the Final Cover? Found your blog from google, yes miniatures are a great hobby. Quarter inch minis are the best, imho. Thanks for visiting 🙂 Love your attic roombox! Enjoyed the post. I spent many years drawing houses and buildings at 1/4″ scale, but I’m a little clumsy to build anything there. Makes my fingers quiver to even think about it. Hi, Earl, thanks for stopping by. It does take steady nerves to build at smaller scales, but it makes me calmer, if it makes any sense at all 🙂 Do you show your drawings anywhere? I am the editor for American Miniaturist Magazine and was wondering if you would like to feature this beautiful quarter inch scale house in an upcoming issue. I would love to share your work with our readers if you would be interested. It’s a great way to reach many people who have a passion for miniatures. You can email me at auralea@ashdown.co.uk if you are interested. Hi, Auralea, thanks for contacting me. Of course I’d love to! I’m sending you an email.